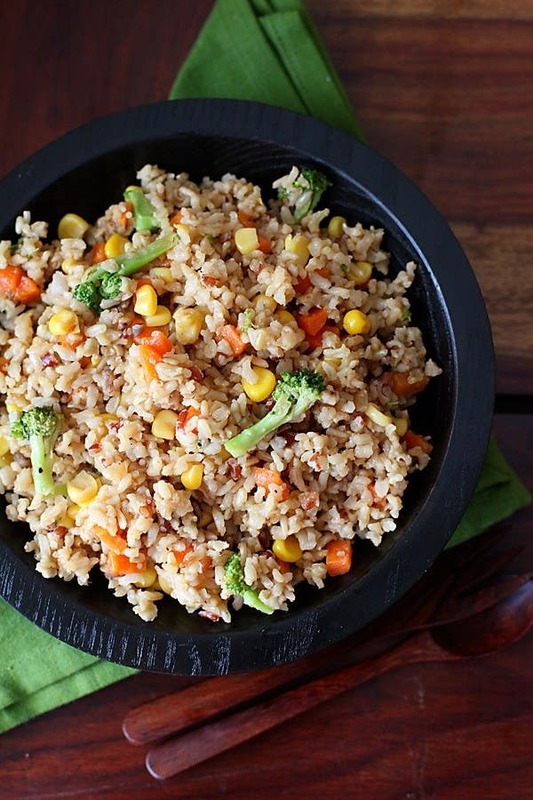 270 gm (1 1/2 cups) brown basmati rice 750 ml (3 cups) water 3 tbsp sesame oil 2 green chilies, deseeded if you wish 1 tsp fresh ginger 1 large or 2 small carrots, cut into cubes or juliennes 15 to 20 French beans, cut into juliennes 1 cup canned corn 1 medium sized broccoli,cut into florets 1/4 cup paneer 3 tbsp soy sauce 1 1/2 tsp salt or to taste Freshly ground pepper, to taste Wash the rice well and cover it for 30 minutes. discard the water and cook with 750 ml (3 cups) of water in an electric rice cooker, pressure cooker or in a pot with a well fitting lid. The cooking time varies for each method. In a wok, heat the oil over a medium flame. Put in the chillies and ginger and stir fry for a minute. Add the vegetables, one after the other and stir fry for 3 to 4 minutes. Lower the flame, cover and cook for a few minutes more until the vegetables are tender, about 4 to 5 minutes.Add paneer , soy sauce, salt and pepper, mix well. Add the cooked rice, stir well and serve.